It was a blustery wet evening when we visited Bolyary Restaurant just before Christmas, but we were soon cheered up by the unusual decor of our surroundings – wood effect wallpaper, wall lights with curtains, and all manner of knick knacks on shelves which I can only assume were authentic Bulgarian artifacts of some kind. They had also adorned the place with wonderfully tacky Christmas decorations that would make your nan jealous. Being back in Eastern European territory, we were unsurprised when we found ourselves looking at a menu of fried edible things. There was a quite a lot of vegetarian options though, and we chose to share two dishes for a bit of variety – namely the mushroom pancakes and vegetable croquettes. Both were sizable portions but as we had to wait awhile for the food to arrive it was quite a welcome sight. The food was pretty bland, as was to be expected, but it wasn’t terrible and pretty good value for the amount of food you got. 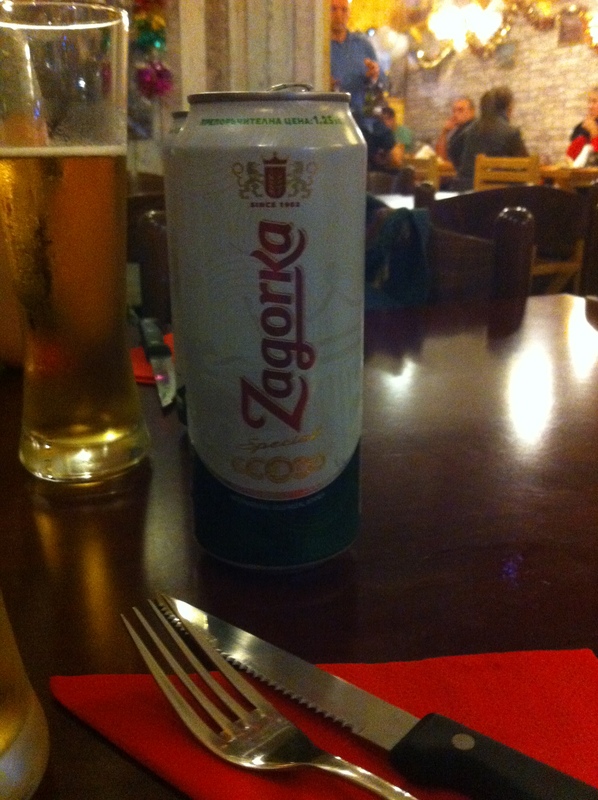 The motherly Bulgarian lady serving us also recommended some good Bulgarian beer which washed the food down nicely. This entry was posted in Uncategorized and tagged beer, bolyary restaurant, bulgaria, Dining, dinner, Dinnergeddon, eastern europe, eating, Eating out, Food, London, palmers green, pancakes, restaurants by dinnergeddon. Bookmark the permalink. Yes Sandi, glad you enjoyed!